“Near the end of March, 1845, I borrowed an axe and went down to the woods by Walden Pond, nearest to where I intended to build my house, and began to cut down some tall, arrowy white pines, still in their youth, for timber. It is difficult to begin without borrowing, but perhaps it is the most generous course thus to permit your fellow-men to have an interest in your enterprise. The owner of the axe, as he released his hold on it, said that it was the apple of his eye; but I returned it sharper than I received it.” (Thoreau, Walden) One of the most beloved books in American literature, Walden is must reading for any American or anyone interested in reading great literature. But for those who go there looking for reasons Thoreau became a recluse they are sure to be disappointed. 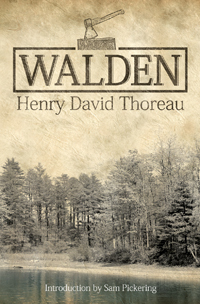 Instead, reading Walden is more of a journey to the self and how that self can live in the world. This new edition has an insightful and lyrical essay introducing the text by Sam Pickering, the inspiration for the Dead Poets Society. His essay is the most provocative piece on Walden since e. B. White.